To build more joy, peace and connection with our children, emotional intelligence helps us tune into our feelings and reactions. We all learn ways of reacting – as we become more skilled in noticing our automatic, recurring reactions we open the door to do something more powerful: Respond. One key is to become more skilled at Recognizing Patterns. 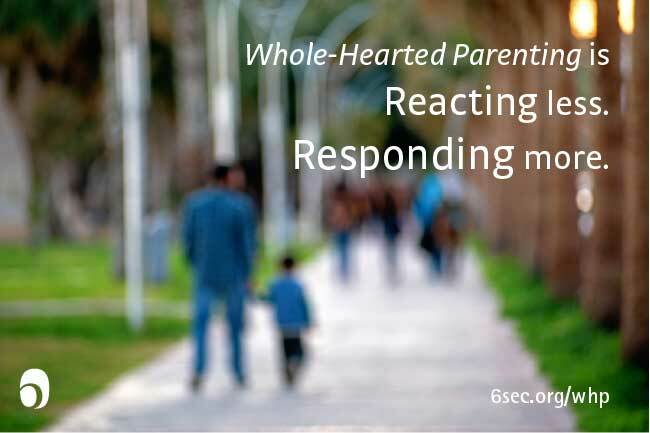 It’s an essential skill for parenting with emotional intelligence, because understanding our recurring reactions creates the awareness that will allow us to find new, more effective ways of responding. How can parents build this strength? 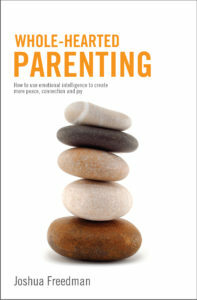 Get a free excerpt from Joshua Freedman’s latest book, Whole-Hearted Parenting. In order to recognize a pattern, we have to become skilled at identifying its ingredients: thoughts, feelings, and actions. Once we identify the ingredients, we can put them into a sequence and see how the pattern starts and how it unfolds. Imagine your child is goofing around at breakfast. You say, “Settle down,” but he continues his behavior. Maybe you feel impatient and wonder, “Is he ever going to learn to listen?” Somehow he ends up knocking over the milk, which careens into a bowl of Cheerios, which splashes into your coffee cup making a tsunami of cereal and milk and coffee, which ends up on your favorite shirt. (Don’t even try to tell me it could never happen.) You know this is because he’s impulsive and doesn’t listen. You shout something you regret, slam your hand down on the table, and in the stunned silence you can’t decide which is worse, the sodden shirt or the fact that you missed the chance to laugh with your kid about the new Cheerio-polka-dot fashion he’s created. Now let’s go back through that story and tease apart the feelings, thoughts, and actions. Thoughts: He’s goofing around. He doesn’t listen. He’s never going to learn. He’s irresponsible. He’s impulsive. Feelings: Impatient. Anxious/afraid. Stressed. Angry (outraged!). Regretful. Actions: Tell him to settle down. Glare. Shout. Slam hand on table. The three are related but different. A thought is an assessment or interpretation. A thought doesn’t create a feeling, but it does influence it. A feeling is just a feeling – a sensation. The feeling doesn’t create the thought or the action, but the feeling does influence them. Consider: You could have the same feeling, the same thought, and a completely different action. While there are many ways of responding to each situation, most of us tend to use one reaction over and over. If this shouting scenario is familiar, then you know that in a way, it feels good to get mad and shout. We do that, and we like something about it, and we do it again. We know that’s not the best solution, but pretty soon it seems to happen automatically. Of course it’s not. Behavior is something we learned in the past and reinforce by practicing – by using it over and over until it’s easy and feels automatic. The first step to changing these automatic reaction is to notice. Then we can learn to respond instead of react. Sometimes it’s easier to notice other people’s patterns. For example, do you know people who tend to blow up when they’re mad? Or people who get very quiet when they’re upset? Or people who leave the room to get away from an uncomfortable situation? How do you usually react when you’re sad? Do you tend to shut down, get mad and blame someone, pretend not to be sad, make a joke, or something else? What’s your usual reaction when you’re happy? Do you enjoy it, worry it won’t last, or overreact or underreact? How do you usually react when you’re mad? Do you shout, take it out on someone else, glare, silently brood, or something else? To practice this part of emotional intelligence, I highly recommend that you keep a journal or logbook. Review two moments of your day — one that didn’t go well, one that did. For each moment, make a chart, and use it to sort out your thoughts, feelings, and actions. Remember a challenging moment from your day and try it now. Are you up for the challenge? Try it for a week, then please come back and share your experience in the comments on this page. I enjoyed the article on Whole-Hearted Parenting. It was an eye opener for me. It also encouraged me to take the week challenge. I’m looking forward to changing my parenting patterns to become a better parent and grandmother o changing one pattern at a time.